Out of stock since Friday, 23 March 2018. Due back soon. Out of stock since Thursday, 7 March 2019. Due back soon. Out of stock since Tuesday, 11 June 2013. Due back soon. Ovicol provides fast, easy, no hassle mixing - mixing well and staying in suspension. The extremely high fat content mirrors that of the mother’s colostrum. This ensures all lambs get the energy necessary for strong and healthy development. 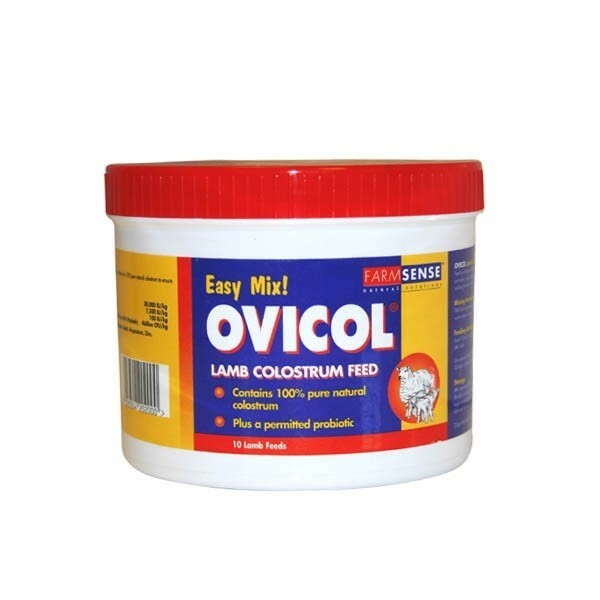 Ovicol contains 100% pure, natural colostrum – no manufactured by-products. This ensures a feed that’s as close as possible to the mother’s own. Lambs are only able to absorb maternal colostrum effectively during the first 16-24 hours of life. After this period, colostrum is no longer effective. 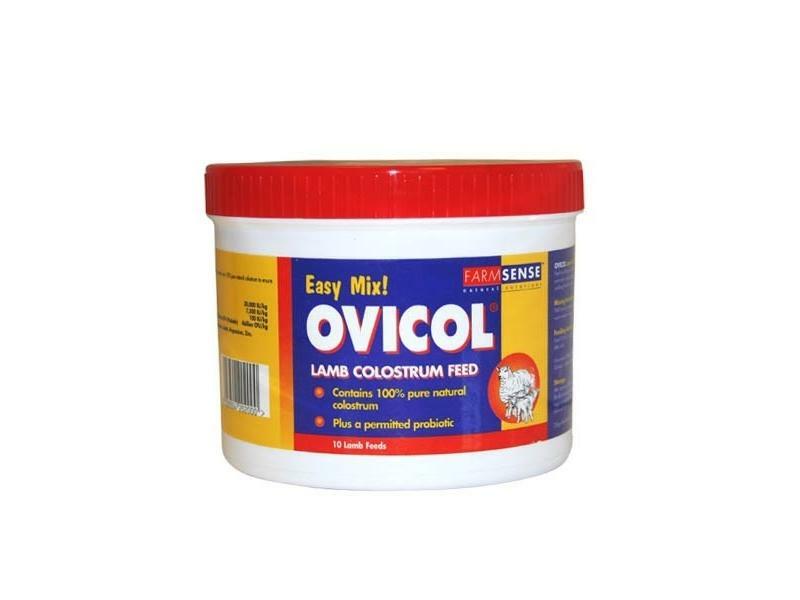 This is why it is essential to use a substitute colostrum product such as Ovicol as soon as possible after a lamb has been suspected to have received deficient colostrum from their mother. A complementary feed for the new-born lamb deprived or deficient in colostrum from its mother. After opening, OVICOL® has an extended shelf life of up to 2 years providing the inner bag is resealed and the container stored between 15-25°C and kept out of direct sunlight. As far as is known or anticipated, there are no hazards associated with the correct use of OVICOL®. Colostrum, Whey protein powder, Vegetable oil, Wheat gluten, Calcium carbonate, D-L methionine, Citric acid, Butylated hydroxy tulvene. Protein 32.3% Oil 20.7% Fibre 0.1% Ash 5.7% Vitamin A 7,500 IU/25g Vitamin D3 1875 IU/25g Vitamin E 43.75 IU/25g Enterococcus faecium M74 (probiotic) 4 billion c.f.u/kg Vitamins present until best before date. Mix 25g OVICOL® (2 level scoops) with 120ml (4 fl. oz.) of warm water, to make 150ml of liquid feed. Feed to the lamb as soon as possible after birth and definitely within 12 hours. Warnings Not for human consumption. Feed to lambs up to 7 days old only. There are currently no questions for FarmSense Ovicol Lamb Colostrum - be the first to ask one!